Key Difference: Salads have been popular for the health benefits provided by them. This dish has evolved over the years, and thus many different types of salads exist today. Broadly, they can be classified into simple and mixed types. 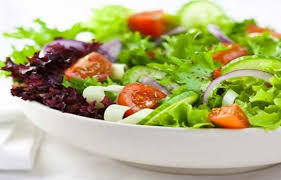 Salad is a dish which is made by using raw edible food items like fruits and vegetables. It is tossed with other cooked or uncooked vegetables or other food items. The word salad has been derived from the word ‘sal’ which means salt. This is due to the fact that salt has remained the key ingredient for dressing of salads. It is generally served cold or at room temperature. It is important to mention that salads should be prepared only with fresh ingredients and no compromise should be made on the quality of ingredients. Salads are known for nutritional value provided by them. Base of the salad is usually a leafy salad green. Next the most important element of a salad is its main ingredient. A substance usually a liquid is added to the salad for dressing it. It helps to enhance the flavor of the salad. Finally, a salad is usually garnished with ingredients which complement the main ingredients. It is also a good choice for people working hard for weight loss. Healthy oils like flax seed and olive oil should be used for oil based dressings of salad. There are many different types of salads in the world. Salads are broadly classified into two categories – simple and mixed salads. Iceberg lettuce with Thousand Island dressing – This salad’s dressing name has got its name from the Thousand island region of upstate New York. 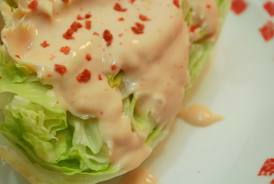 Iceberg lettuce is the main ingredient of this salad which is dressed by a sauce made mainly from Mayonnaise. Sauce is made by using ingredients like mayonnaise, tomato ketchup, spring onions, gherkin, Worcestershire sauce, parsley, black pepper and juice of lemon. The sauce is spooned over the wedges of iceberg lettuce. 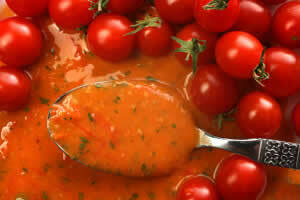 Tomatoes salad with Vinaigrette dressing– Tomatoes are main ingredients of this salad. The vinaigrette dressing was also known as French dressing sometimes. It is a dressing which is made by the combining vinegar with a form of oil. It may also contain flavored ingredients like spices and herbs. Olive oil is preferred for making this dressing. Mixed salads – Unlike simple salads, they are made by combination of more than one type of ingredient. These are also dressed with an apt dressing. Dressing helps in binding the ingredients together. Coleslaw salad with mayonnaise is this type of salad. These salads are also referred to as mixed salad sometimes. Composed Salads – The ingredients of the composed salad are not mixed and tossed. However, it is the arrangement of ingredients which plays a vital role in this type of salad. After a suitable arrangement of the ingredients, the dressing is poured over it or is served separately. 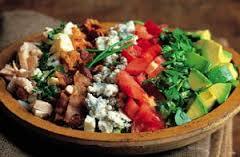 Salad nicoise and Cobb salads are examples of a composed salad. Classical salads – It covers all those salads which have been around since a long time. They also cover many ethnic or cultural salads as they tend to be famous in counter other than the ones in which they originated. These salads are popular for their classic styles of preparation. 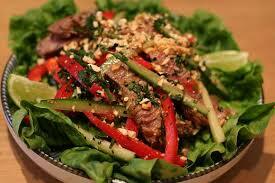 Thai beef salad is a classical salad. Vegetable Salads – It refers to all those salads in which only vegetable ingredients are used. It is served with a suitable dressing. A simple vegetable salad can be made by arranging string beans, corn, beets and asparagus on lettuce. It is often served with Russian dressing. Fruit salads – These salads are made of fruits only. They may contain one or different types of seasonal fruits. Fruits are chopped and then they are usually tossed in a syrup or juice. It acts as a superb dessert which takes very less time to prepare. 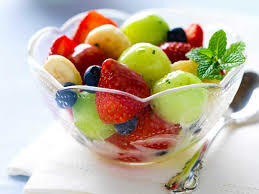 Fruit salads which are mixed with sugar and alcohol are also known as fruit cocktail. Warm Salads – This salad contain a warm or cooked item as one of its ingredient. 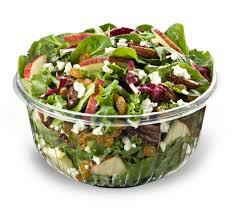 For example a salad containing cooked meat will be known as a warm salad. The presence of warm ingredients makes these salads desirable during winters. Warm potato salad and char grilled lamb salad are two such examples.